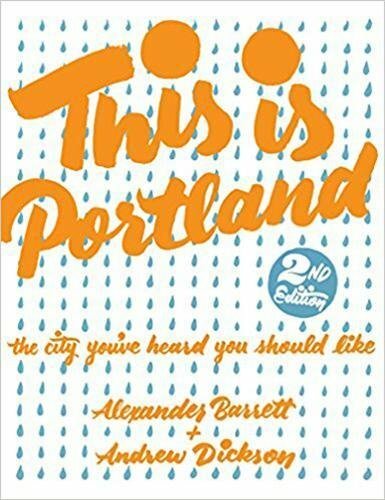 Its title, “This is Portland: The City You’ve Heard You Should Like” definitely made me want to pick this book up and delve into it - especially considering its allure for today’s younger generation. The guide’s graphic design and general layout is bold and quirky - just like I had imagined it to be. It’s true that people will tell you that Portland, Oregon is “the best city ever.” And when you ask why, they reply, “it just is.” I like that this book explains why. And, it has two authors: the original writer, Alexander Barrett who penned the book’s first edition and long-time Portland resident, Andrew Dickson. So, it gives you information from both sides of the fence - as tourist and citizen. The guide boasts of bikes, beer, books, beards, bridges, BBQs, bubblers, baristas, bakeries and bands. So many B-words, the place should be called Bortland. The authors explain that the most Portland-type is “alternative, business casual, stubbornly eco-friendly, doesn’t care how stupid he looks and involves the suffix, “cycle.” In communicating the nature of the culture that is Portland, this scenario explains things perfectly: When you meet someone here for the first time he doesn’t ask, “What do you do?” he asks, “What do you like?” And that is because this culture is based on living the life you want. In short order this book verifies this premise with accounts of highly specific food, craft and entertainment options - you certainly get the idea that there is something for everyone. I love the casual speak these authors offer. They are honest yet not insistent, relaxed but still concise. The book communicates what it needs to through narration, fun wording and unique paragraph construction. It tells you that Portland’s reputation, although still vibrant, is changing due to the influx of people - but only slightly. Although its popularity may be increasing, it is the unconventionality that everyone still comes to experience. Its attractive cover and small dimensions make you think you are getting the ideal travel size book for this trending place called Portland. But “This is Portland” is not a destination guide filled with hotel, restaurant and attraction recommendations. It is an explanation, a true confessions type chronicle that spells out the culture and the vibe of the city. But don’t dismay, you will most certainly be informed if or when you visit the city. In fact, you may be so enlightened by this guide you won’t even feel or look like a tourist when you arrive. Buy, borrow or barter for this one - it is a unique treasure.